TGIF Team Stryker fans! You have no idea how glad I am that it’s Friday. Since last Friday I’ve been on call 24/7 for my condo management company’s emergency phone. That means during the worst natural disaster to ever hit Calgary I was the one taking phone calls for 38 condo properties. It was so tiring and stressful I wasn’t sure I was going to be able to make it til the end of the week. This weekend is looking up as I’m off early today and I have a 3 day weekend to look forward to and to spend some more time on Team Stryker! Today’s page was probably in my top 5 pages of all time to draw. Anytime I get to draw “hero shots” of all four members of TS it’s always good times. When I do pages like this it’s a great feeling knowing just how different each character is. You will NEVER see Deadeye sleeping on the Job and you will NEVER see Casanova wielding 3 different knives. 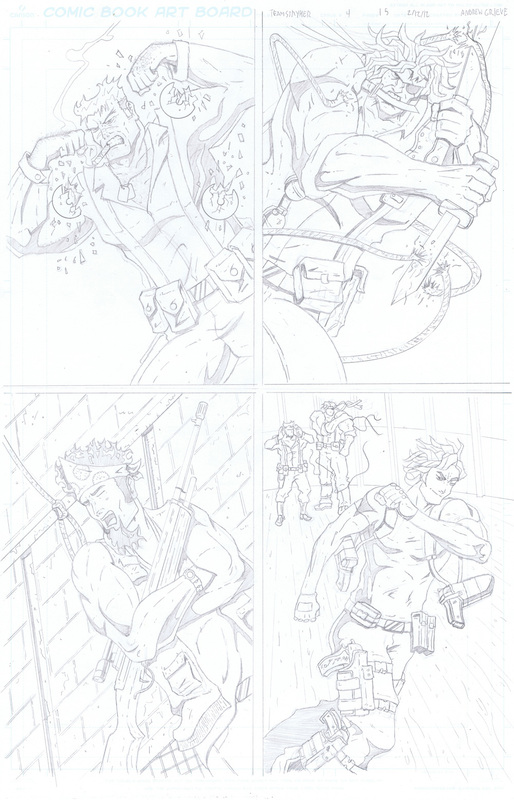 What has been your all time favorite page of Team Stryker? Let me know in the comments below or on Facebook or Twitter.